For all you dyers out there this is a simple recipe for making a wonderful blue dye. The color of blue will vary depending on your water source. All fibers seem to take this dye. Place the copper into the gallon jar, pour in the 1 quart of ammonia and the 3 quarts of water. Cover and let stand for 1 week or so until the color turns from a light blue to a deep royal blue. Now it’s ready to use. Drop a handful of wet, clean fleece, yarn, silk or cotton in. You don’t need to stir it but don’t let it sit on top. Take it out within 15 minutes, If you want it darker you may put it back in . Leaving the fiber in for longer than 30 minutes may cause damage to the fiber. This dye can be used for approximately 8 months then new ammonia can be added. I think its best to make a new solution. Colors will vary from blue-green to a deep royal blue depending on your water source. A while later, armed with a NY Times article on the wool industry in Vermont and several clippings about Angora goats and mohair sent to us by a friend’s 90 year old father who had taken our search for the perfect animal and product very seriously, we headed north to buy our first Angora goats. We knew nothing about farming except that we didn’t want the daily demands of dairy nor the goal implicit in raising meat animals. But we learned quickly through books and magazines, from neighbor farmers and other goat breeders and by trial and error. 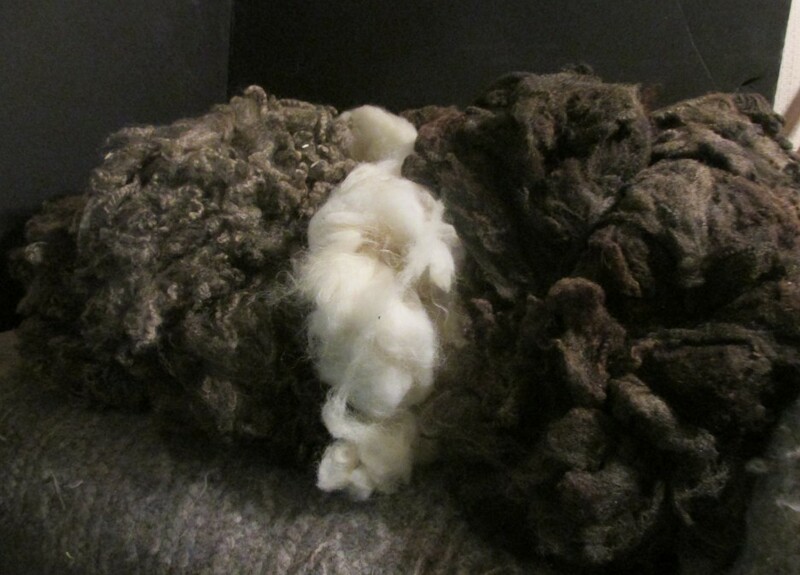 Our shearer soon became our advisor and go-to vet in an emergency and it wasn’t long before we brought our first fleeces up to the Green Mountain Spinnery where it was transformed into a soft beautiful single-ply yarn. Great, except that we were out of funds! Then one day serendipitously I got a call from a woman I had only met once asking if I would sell her our mohair; she had decided to go into the mohair blanket business. Without stopping to consider how brash I sounded I said, “I have a better idea. Let’s go into business together because I have no money but lots of ideas!” “Great,” she said…and so Moonshine Design was born. If Bob and I were naïve, Sarah and I were even more ignorant when it came to the creation of yarn. Keldaby’s first yarn was fabulous, Moonshine Design’s attempt to replicate it was a disaster. We had become shareholders in a Quebec-based co-op mill where English was barely spoken . We visited and using hand gestures, whatever remained of our college French and a self-assurance based on a total lack of knowledge, we left raw mohair there with instructions and samples of the yarn we wanted. What we didn’t know, and didn’t know to ask about, was that Green Mountain Spinnery is a woolen mill and Cabritex a worsted. The resulting comedy of errors we named TURP yarn because when we got it back it was like butcher’s twine, hard and skinny! Back it went to Cabritex because we thought untwisting it would soften and plump it up a bit but instead turned it into mush that couldn’t even be dyed! Back again it went for retwisting! Next we implored David Ritchie up at Green Mountain Spinnery to ply the whole run of this useless Cabritex yarn, so there we were with TURP: Twisted, Untwisted, Retwisted and Plied. It was all fruitless, the yarn shed and shed….and shed. And so did the throws we had Peggy Hart (Bedfellows Blankets) weave for us on her 1940s vintage mechanical looms. It set us back a year but didn’t discourage us for long. Our next yarn was a wonderful “faux” boucle that we had made as long as Cabritex lasted—the cost of production was so reasonable that the business couldn’t survive. Since then we have used Green Mountain Spinnery for more than 90 percent of our yarn. Through a friend we found a Quebecoise weaver who wove for us several years before teaching me the rudiments. I now do all the weaving and some portion of the knitting although a friend of mine, Betsey, makes an incredible number of texting mitts, hats, mittens, baby caps and booties for me every year. Moonshine Design has always done all its own dyeing using Lanaset acid dyes—very reproducible, consistent and color-fast with just white vinegar to set the colors. The business grew over the years and eventually Sarah decided to bow out. Bob and I now run Moonshine Design—he and I go to a number of shows mostly in the autumn. We used to keep our flock of between 40 and 60 although one crazy year we had nearly 90 goats on 15 acres—all of them named. Try trimming 360 hooves every six or eight weeks! Today just seven young wethers remain, barely enough to keep me in farm-raised yarn. The animals, the products, the business itself, however, still delight us so we have no plans to quit any time soon!